FABRIC was the first choice of the mountain newcomer. Shirts and trousers came in off white, natural, blue, red, large prints or striped calico. The newcomer might also have teamed up his wardrobe with boots or brogans. Fabrics, although comfortable, were not durable under the hard usage in the mountains, and replacement was not possible except at rendezvous or the widely scattered trading posts. BUCKSKIN replaced fabric clothing as those wore out. 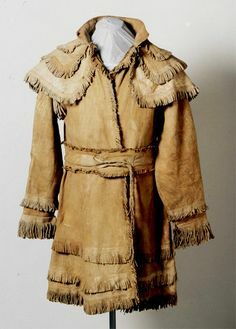 Buckskin clothing was generally patterned after white styles, rather than Indian styles. The fringe appeared to be mainly decorative, although it may have softened the wearer’s profile making him less of a target in the woods. Buckskin, although cold in the winter and hot in the summer, had the advantage in that it was extremely durable. It wore like iron, provided protection from mosquitoes and other biting insects, as well as from thorns and brambles. Buckskin also had the advantage in that the raw materials were available in the wilderness and could be secured from the Indians. SHIRTS worn by the mountain man would have been a simple pullover design with a large body and loose fitting sleeves. Solid colors, especially red, but including blue, green and yellow were favorites. Shirts were a popular trade item at rendezvous and in any year hundreds might have been taken to the mountains. Belts were not used to secure trousers at this time, but rather suspenders, ties or cinches. Instead of trousers, a Mountain Man may have chosen to wear Leggings and a breechclout. LEGGINGS were held up using either ties or garters. Leggings and breechclout had the advantage in that they were simple to make, very comfortable and functional. Also, when setting traps, leggings were very easy to remove and put on. The purpose of a BELT was not to suspend the trouser. They were generally not wider than two inches and used to carry weapons such as sheath knives, tomahawks, and perhaps a pistol. Belts were left simple, without tacks or rivets, and a buckle, when visible, was generally worn to the side. KNIVES were kept in simple sheaths at the back. Decoration was limited to a single row of tacks along the blade edge of the sheath. Most sheaths did not have a belt slot, but were simply thrust through the belt. HUNTING COATS were often of leather and open in the front. These coats were elaborately fringed along the shoulders, sleeves, fronts and bottoms. They range in length from mid-thigh to knee, and are generally shown with well-fitted sleeves and collars. The coats do not have buttons, but close using ties. For cool and cold weather, the Mountain Man would wear a capote. A CAPOTE is a long coat of simple design often with a hood. It was made from wool blankets, or wool blanket material which could be cut and assembled in the mountains. Capotes were also available for trade at rendezvous and at the posts. The capote dates back to at least the early 1700’s and was popular to at least the 1870’s. Although designed as a coat, the capote could also be used as an extra blanket for sleeping during cold weather. The capote alone is warm and comfortable, however, was large and loose enough that it could be worn over multiple layers of winter clothing. BUFFALO ROBES are made of the tanned and softened whole-hide of the buffalo. Robes which include both the head and tail were exceptionally valuable to the Indians because they believed that the skin would inherit the spirit of the Buffalo in its completeness. Robes were prized both by the Indians and Mountain Men as a type of overcoat worn during the coldest times. Robes were simply draped over the shoulders, and held closed with the hands, or they were sometimes belted in the middle. As boots or BROGANS wore out, they were replaced by MOCCASINS. Some men of the period, while outfitting in St. Louis were reported to have traded their boots for moccasins without waiting for them to wear out. Shoes, both men’s and women’s styles, were not an uncommon item on trade inventories. The women’s shoes were obviously intended as trade items for the Indian wives of men stationed in the mountains. HATS worn by the Mountain Men were wide, flat brimmed felt styles with a low crown that became twisted and bent from hard use. Felt hats were mostly light colored, off-white, tan or grey. Hat bands were simple cord, strap or ribbon. Hats were often decorated with feathers or tails and a clay pipe is often held in the hatband. HOODS were also worn and appeared to be made from blanket material or leather. Many were constructed with “ears” and a flap reaching down to the shoulders. Fur hats, especially those with face, legs and tail, which are so popular at modern rendezvous and Hollywood movies, are not shown in any paintings or drawings from the time and were most likely not worn. Hat fashions changed by the beginning of the 1850’s, reflecting high crowns. Hats made of fabric with a leather bill also emerged. BEAD and QUILL WORK, when present, they were simple narrow bands of color or bands of alternating colors and were actually rare decor. Elaborately beaded or quilled clothing would be analogous to wearing gang colors and a mountain man would be asking to lose his scalp if he found himself in the wrong neighborhood. Visitors to The Bear Lake Rendezvous who choose to come in authentic dress will gain free admission! Gate fees for all other guests are $3.00 per person, per day. Lodgers in the Primitive camp and Traders must adhere to authentic dress requirements. Many different styles of lodging were used by the mountain man but most of it was quick to setup and easy to move. The replica shelters that we use today are usually made of heavy canvas, and some are even coated with a fire resistant material. 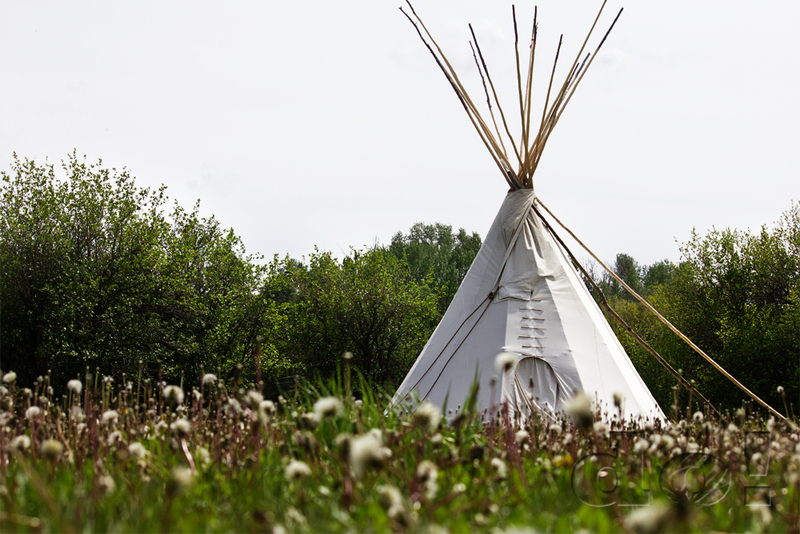 There are many affordable ways to create your own authentic shelter. 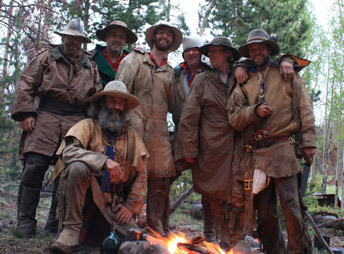 Here are some of the more common styles used during the mountain man era. This shelter can be easily created using a single large piece of canvas such as a painterʼs tarp or several smaller pieces stitched together. This shelter can also be created using a single large piece of canvas, or several pieces sewn together. Cloth loops, or re-enforced holes need to be added to the edges of the canvas so that it can be staked down. A wooden pole is placed at each end, and can be stabilized by a support rope staked in front and back , or by a ridge pole running between the two upright poles. This shelter is very similar to the open A-frame, but it has flaps added to the front and back. It adds more privacy and warmth. Adding ties to the flaps so that it may be secured to the upright poles, cuts back on the wind blowing through. For warmer evenings, two additional poles can lift the side of the closed A-frame up. This creates a small awning. If the wind picks up simply lower the side again. This shelter is made from a single square piece of canvas. The canvas is staked out on three corners and then the forth corner is lifted, and tied to a pole or near by tree. Often a second pole is used inside to push the center of the square up. A more effective way of doing this is to add a loop of fabric or a tie on the outside, in the center of the square and to tie it to a ridge pole or tree. This shelter is also known as a diamond shelter. It can be configured in several ways depending on how many poles you wish to use, or where there are near by trees to attach it to. It can also be made into a simple Lean-To, or an Open A-Frame. The primary features of a diamond shelter are its square shape, ability to be tied or staked on all four corners, and a tie directly in the center of the square. You can purchase versions of this shelter with ties all along the four edges, which make it more versatile. It is a rather inexpensive shelter to buy pre-made, but can also be made easily out of a piece of heavy canvas. What did a Mountain Man eat? Meat, meat and more meat! Or, conversely, whatever there happened to be to eat! Food stuff was often salted or dried to preserve it, so cooking consisted of attempting to make the food palatable. And if it wasn’t, they ate it anyway. Imagine a daily diet of bacon, salt pork, smoked ham, dried or corned beef, smoked, salted, and dried fish, and the occasional fresh game. Other staples included biscuits, pancakes, fry and corn bread with the occasional bean, hominy, rice and peas to round out the food pyramid. It’s a good thing Mountain Men were always on the move! Mountain Men might eat the same foods, day after day, for months at a time. There was no room for being fastidious or finicky. Journals of the Mountain Man often mention eating such things as moccasins, saddles or rawhide straps during the lean moments. Maybe that’s where the myth came about that Mountain Men softened their leather by chewing it? Canned goods were first produced in 1813 for the English military, and 20 years later were provided in British grocery stores, but canned goods in the West didn’t really come about until the California Gold Rush in 1849. The first show of any canned goods at a Rendezvous was in 1837 when Sir William Drummond Stewart brought sardines. Portions of the intestine of Buffalo were filled with wild onions and other herbs and spices, tied off and roasted until sizzling. Called Boudins these “sausages” were considered a delicacy and were always a favorite, while also providing vitamins and nutrients otherwise lacking in a diet composed largely of red meat. Pemmican is made with a combination of dried meat, dried fruit, and rendered grease. The dried meat and fruit are pounded to very fine particles or meal. Just enough hot grease is poured over the mixture of meat and fruit to moisten it. The mixture is then packed into a skin sack or bladder. It was the Mountain Man “Power Bar” and a source of high energy food, easily transported or carried, that wouldn’t spoil for months on the trail. The Mountain Men ate most of their food without any seasoning at all. Spices, however, were shipped to rendezvous, and for at least limited times after rendezvous, must have been available for seasoning foods. Spices known to have been packed to rendezvous included: sugar; salt; pepper and allspice. Salt for seasoning or for curing hides could also be obtained from salt springs and salt deposits found at some localities in the western mountains. 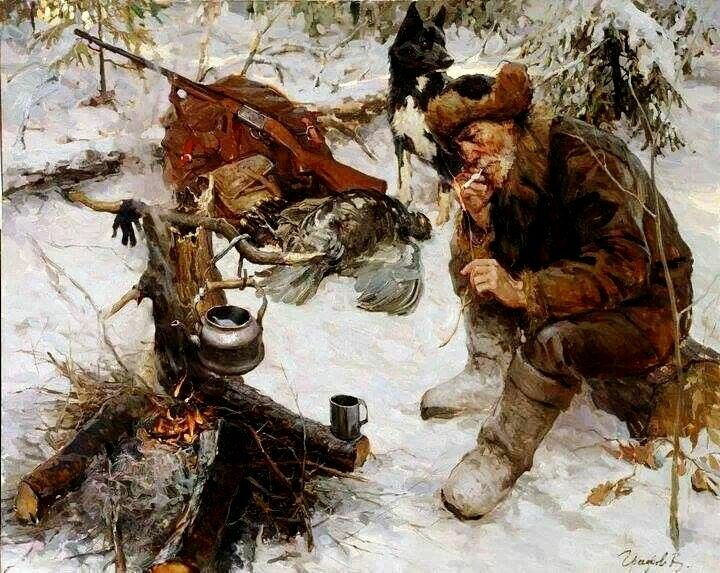 When available, coffee and tea were the preferred drinks of the Mountain Man. Large quantities of both were shipped to the mountains for rendezvous. Milk was sometimes available at forts or posts, or from the semi-wild cattle that roamed ranches in Mexico and the southwest. Then there is Mountain Cider, Bitters and High Wine. Google them if you would like to be disgusted. Alcohol was an important element in the fur trade from its origins in the earliest 1600’s through the end of the era in the 1840’s. During the rendezvous period (and earlier) all distilled liquors were colorless. 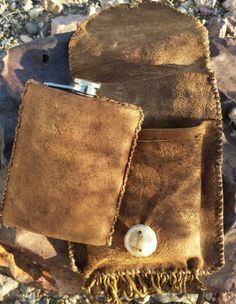 Large profits were assured through use of alcohol prior and during trading with the fur gathers, whether they were free trappers, company men or Indians. Alcohol packed to rendezvous was extremely high proof. Once at rendezvous or trading post, the alcohol was generally diluted with water at a ratio of 1:2 or 1:4 or even more. This increased the volume of the product and profits. Interested in the origin of the term, “Firewater?” In order to test the potency of a liquor, a mountain man, or Indian would dash some of the liquid on the campfire. If the fire roared up, it was determined to be the good stuff. If the fire was doused, it was determined that the liquor had been too diluted. This, however, may also be one of those mountain man myths.